If, and a very big if, Martian methane is of organic origin, what then? It could be from life forms long since extinct or from contemporary ones. There could be life under the surface. The line from Exodus about the waters under the earth probably means ordinary fish. There was a god Dagon that was worshiped around that time, a fish god. The name was probably pronounced “doggone,” so have a care the next time you swear thus. You may be invoking ancient power. Water, after all, does run down hill, so the “waters under the earth” probably just means the sea is lower than the land. But it does make you think. These are very strange and very tough organisms, surviving under conditions far beyond anything we ordinarily see. They are very primitive, and there are a lot of them, a significant fraction of the total biomass of the earth. Some are archaea, ancient form more distantly related to ordinary bacteria than we are ourselves. Many, particularly in the seabed, live on sediment from the biosphere we know. Others live from chemicals derived from radioactive decay or other geologic sources, like the microorganisms that live in the geothermal vents of the deep sea. Some of them have very slow metabolisms and reproductive rates. Some people say there are those that divide one each thousand years. These deep creatures may be an example of the adaptability of life, the frontier pushing into extreme environments. They can survive just about anything but fresh air and sunshine. But it may be the other way around. Perhaps this was the first form of life. We may be their descendents ourselves, emerging after eons to live in an environment bathed in ultraviolet light and more recently in an atmosphere poisoned by oxygen. They are so strange that there are those who think there is a shadow biosphere. There may be organisms that arose completely independently of us. (Soundbites from Chicago, some insights from this years meeting of the American Association for the Advancement of Science, NATURE vol. 457 no. 7232, February 19, 2009 quoting Paul Davies of Arizona State University) They would not have the same DNA code or use all the same amino acids. Is there intelligent life down there? It does not seem likely, but we evolved it up here. And our sampling of those depths is so skimpy it makes our knowledge of the sea (in turn far less well known that the surface of the moon) seem like a done deal. So there might be life far beneath the Martian terrain. As it turns out, it is not terribly rare for a meteor to strike Mars and cast up debris, some of which lands here. It may go the other way, too. Given the extreme toughness of these deep organisms, some might have survived the trip. The possibility could be considered that one of the two planets seeded the other with life. Perhaps if they are there and we find them, they will prove to have our own DNA code. Then Martians would be our long lost cousins. If that is the case, we might be able to catch each others diseases. Simple prudence would require an absolute and permanent quarantine if there is life there. That might not be such a bad idea anyway. In fact, you have to wonder about the moon. You remember “The War of the Worlds,” in which a Martian invasion of Earth fizzled when earth bacteria wiped out the Martians. Imagine what would have happened on Mars if upon landing they had sent back a ship to report that all was going as planned. That Chinese probe was supposed to bring back samples from the Mars moon Phobos. Maybe it is just as well it was postponed. Now there are spoilsports who say we should spend our space dollars on something closer to home. Here is a graph of data from a pair of satellites put up to monitor the thickness of glaciers on Greenland actually, and the South Pole. They speed up and slow down as they pass over the glaciers because of the gravity of the ice. That causes the distance between them to change, which gives you a measure of the mass of ice. 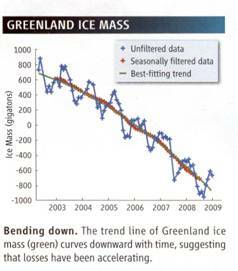 As you can see, the ice loss appears to be real and to be accelerating over the past 6 years. That’s the sort of thing you ought to keep your eye on. But the satellites are very low and will fall in 2013. So far there is no plan to replace them. 5. Lost civilization on Mars. Since this is a science fiction and fantasy fiction convention, we can go even farther. What about a high tech civilization on Mars? Google Mars seems to make it pretty clear that there is no system of irrigation canals on Mars, but some things have turned up. There is a suggestion that a fossil of a macroscopic organism has been found. The picture below is from Mars Exploration and the “F Word” ATLANTIS RISING March/April 2009 page 4. I am sure there is a clearer image somewhere. It is a fossil? Your guess is as good as mine. Image from The Face On Mars, Randolfo, Rafael Pozos, Chicago Review Press, Chicago, 1986. I would have thought there would be a small cottage industry of selling really good prints of evocative pictures like this. I understand they are supposed to be available from NASA, but when I tried years ago I had no joy. Anyway, as you can see, it looks kind of like a face. Then over to the left are some pyramid shaped things that fascinated Hoagland. Straight to the left of the face and a trifle higher is something that strikes me as most remarkable. It is on about the same scale and shape as the pyramids, but it looks for all the world like the top has fallen in, and that we are looking at the broken tops of two walls of he same thickness. Well that is about as far as I can go with it. It’s a picture. NASA certainly did not concoct it to make us think there was a lost civilization there. They said it was a trick of light and shadow. After some years, they were hounded into re-photographing the same area. The repeat picture looked nothing like a face. I am sorry I do not have the pictures they released, but it was clear at a glance that the image had been digitally filtered to remove information on the scale that was of interest. A nearby crater looked as flat as a flounder. To add insult to injury, they released the picture upside down. Either they were being total clowns, or they tried to mislead us, and they didn’t put their best talent on it. They later released a less grotesquely misleading version of the picture, but for my money their credibility was shot. That, of course, does not mean the picture is significant. All sorts of strange things turn up in pictures. This is just in. There is another face. First let me tell you about one that was a mystery for a short while. You won’t see this on the history channel yet, but it dates back to World War II. The marines would storm an island. It was terribly dangerous. The defenders could not retreat because they were on an island. The island would be heavily fortified with troops and gun emplacements dug in well ahead of time. The beach would be defended by obstacles like railroad rails welded together to impede landing craft. Those had to be cleared by sending in the frogmen or Underwater Demolition Team to blow them up the night before the invasion. So the defenders had little trouble knowing just when and where the attack would come. This fearsome invasion force would storm ashore into withering fire with terrible losses. And they would find, painted on a wall or some suitable surface and as high as a man something like this picture. And so it went, island after island, deathtrap after deathtrap, bloodbath after bloodbath for a long time. In the end it turned out that it was the frogmen. They would slip ashore in the night and paint it up just to jerk the marines around. So prepared, take a look below at what was released by the University of Arizona from Mars Reconnaissance Orbiter. Picture and story from “2001-like Monolith Discovered on Mars,” Atlantis Rising, November/December, 2009, page 14. They pointed out something in the red square that looks like an obelisk from the movie “2001.” It’s about 15 meters or about 45 feet wide, which would make it 90 feet tall. Below it is turned around straight up and down. One cannot deny a certain resemblance. But and context is everything. They didn’t mention this in the article, look over toward the left. There is another one with a cap on it like Stonehenge. And in between, is something that looks a little like our old friend Killroy, with some kind of symbol on his forehead. Maybe it’s a hexagon. And he’s sticking his tongue out at us. It seems clear that somebody is making fun of us. It remains a bit of a question as to what planet that person lives on. 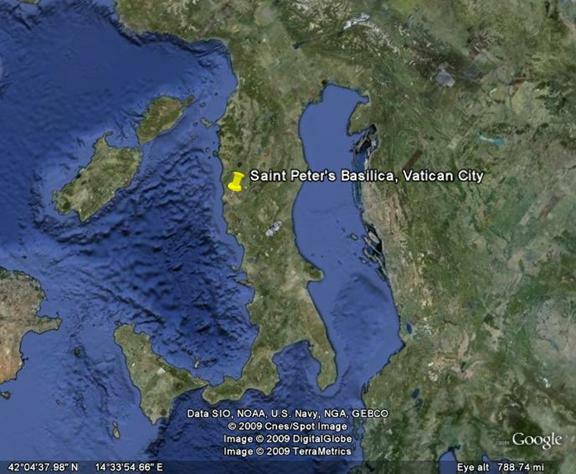 Closer to home, Google Earth released a version that showed the sea floor as well as the land. It included this in the Atlantic. It shows a grid pattern in the floor of the Atlantic. 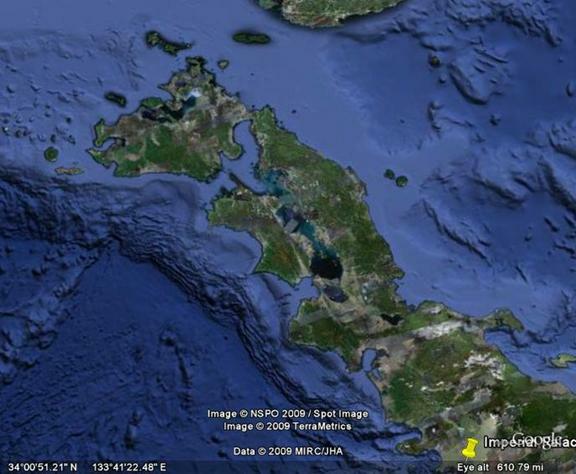 Of course there were immediate cries of “The lost continent!” and Google immediately announced that it was no street pattern; it was an artifact of the course of the ship that had done the soundings. Neither idea seems very sound. There is no point in building streets on the bottom of the sea. Anything big enough to use them could swim. And if Atlantis sank, where is the edge? It would have to be the whole Atlantic Ocean, which would have done spectacular things to the sea level. And the sea level could not have been that low. Where would you put all the water? If you tried to pile it up as glaciers on the continents, the tops would be above the weather. They couldn’t grow that high. The soundingss artifact seems weird, too. Why aren’t there similar artifacts elsewhere? Why did the ship make such clean corners? Why did it leave defects? It’s a map of a lost civilization in the Amazon. Lost Cities of the Amazon, Michael J. Heckenberger, SCIENTIFIC AMERICAN vol. 301 no. 4, October, 2009 page 64. The black lines and the dashed lines are excavated roads, nice straight roads, and places they think roads were but haven’t excavated them. They are close enough to being 10 miles apart. As I remember, there was once a similar layout in Mesopotamia. Villages were spaced about 10 miles apart. So the 10 mile blocks is no problem. It’s called a garden city. You can see faces in trees and animals in clouds. Italy looks like a boot. 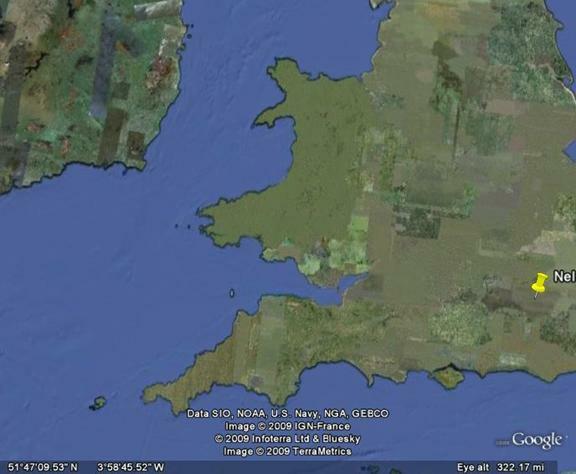 Wales looks like a pig. Japan looks like a dragon. 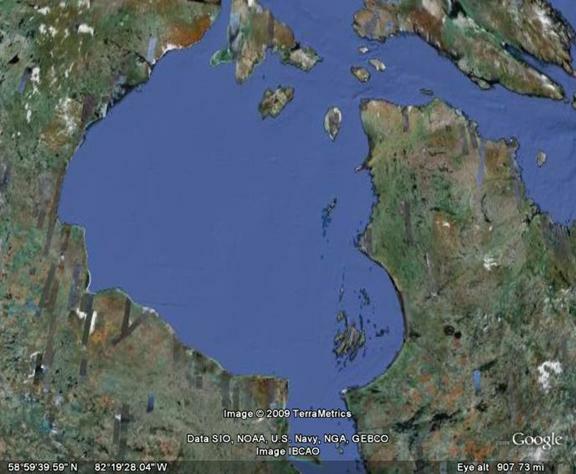 Hudson’s Bay looks like a bunch of craters. 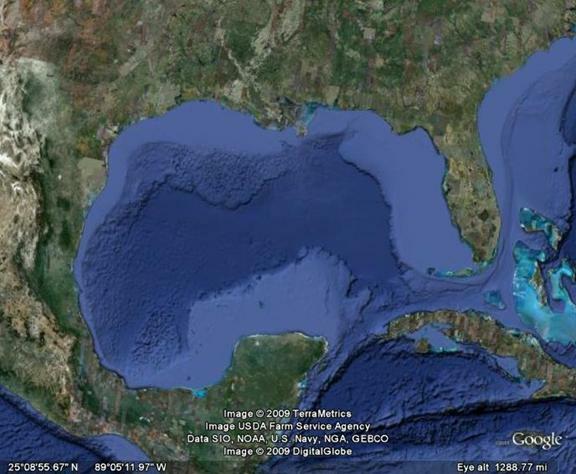 The Gulf of Mexico looks like craters or maybe a dolphin. The trouble is that these things have no context. That’s why Hoagland was so eager to put the Face on Mars into the context of what he thought were artificial structures nearby. Try this for context. It is a triple image: there is a wing, a heart and a turtle. Can you see them? The wing is something in the heavens above, the heart is on the earth, and the turtle is an aquatic reptile. It is flat. A tortoise is a land animal and is taller. So the turtle is something that is in the waters under the earth. Guess where it is. If you think it might be an artifact, go and have a look. It is accessible to tourists. The view is from the east. That center square is at the tip of the heart is Mount Sinai. There have been 16,400 visitors so far.